Commander David Scott (1932-) examining the Genesis Rock at Lyndon B. Johnson Space Center in Houston, Texas. 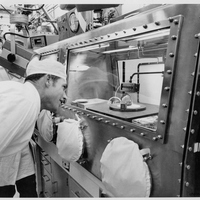 The Genesis rock was a lunar sample that Scott and Lunar Module Pilot James Irwin (1930-1991) collected while on the Moon during the Apollo 15 mission. The sample was found to be approximately 4.1 billion years old. Apollo 15 was the first of three extended capabilities missions, which allowed astronauts greater mobility with the Lunar Rover and additional equipment. The mission was crewed by Scott, Irwin, and Command Module Pilot Alfred Worden (1932-), and was launched from Launch Complex 39A (LC-39A) at John F. Kennedy Space Center (KSC) in Merritt Island, Florida, on July 26, 1971. Apollo 15 continued on a 12-day mission, including a Moon landing on July 30 and a Pacific Ocean splashdown on August 7. Original black and white photographic print, August 18, 1971: Larry Summers Collection. Digital reproduction of original black and white photographic print, August 18, 1971. "Apollo 15: Lunar Samples Overview." Lunar and Planetary Institute. Accessed July 7, 2015. http://www.lpi.usra.edu/lunar/missions/apollo/apollo_15/samples/. 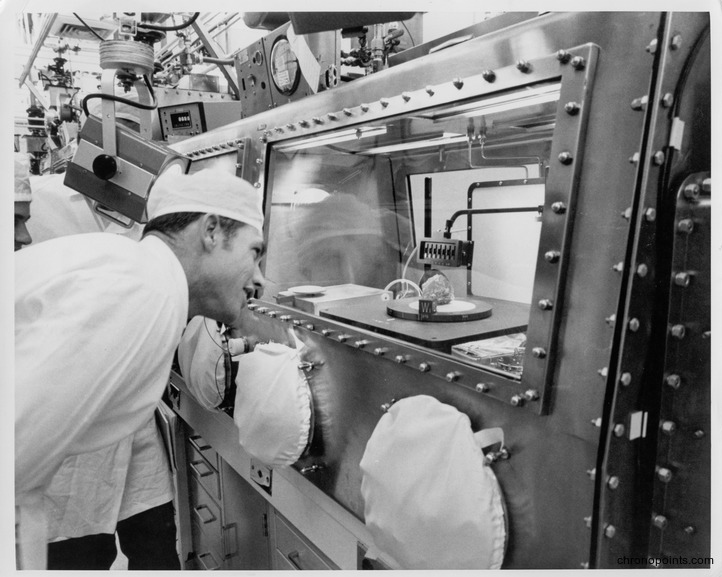 “Astronaut David Scott Examining the Genesis Rock.” RICHES of Central Florida accessed April 25, 2019, https://richesmi.cah.ucf.edu/omeka/items/show/5984.